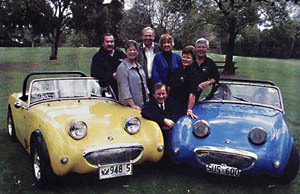 The Sprite Car Club was first established in 1972 by Reinhard Walker, Richard Stokes, Mandy Stokes, Dean King, Helen King , Kevin Warren,and Marilyn Warren. The idea of forming a Club grew from a mutual interest in Sprites.In August 1972, two Sprite owners/ enthusiasts were looking for spare parts at an auto wrecker when a third Sprite owner/enthusiast arrived on the scene for the same reason. They decided a Sprite Club was needed, and to tag as many Sprite owners as possible. 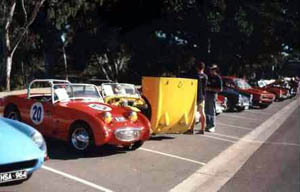 The inaugural meeting of the Sprite Club of South Australia was held in the staff live-in quarters of the National Bank in North Adelaide on Wednesday, 13 September, 1972. Approximately ten people were present and elected Kevin Warren as President and Joe Walker as Secretary. All of the founding members are still active in the Club. With over 120 members and a good variety of events throughout the year, including Club runs, Sprints, Weekends away, Barbeques, Social outings and Motor sport, the Club has continued to grow. The Sprite Club fosters the spirit of community and the love for British Sports cars and above all exists to Promote, Foster and Preserve the Austin-Healey Sprite and MG Midget. Communication is through this website. Membership is is open to Sprite/ MG Midget owners for an annual fee, currently set at $30.00 per single and $40.00 per family. Historic Registration is available to eligible members. This system is ideal for cars that are used occasionally, allowing up to 90 days of registration per year, for a discounted registration fee. Further information can be obtained by contacting the club via the contact page.